Very terrible, impossibly aggravating, and extremely upsetting VERY ssssslllllloooooooooowwww internet connections thwarted our usual volume of genealogy blogging, tweeting and Facebooking last week during the RootsTech 2012 conference. This was frustrating for those wishing to enter the DearMYRTLE: Name that Gadget Contest. Whereas a typical blog post usually prompts about 50-75 emails, FB, G+ or "blog comment" responses, the DearMYRTLE: Name that Gadget Contest got all of 15 responses. Hmmm. Being the ever-wonderful, incredibly agreeable GeneaMyrt that I am, I hereby officially revise the rules. Photo courtesy of Randy Seaver of GeneaMusings. 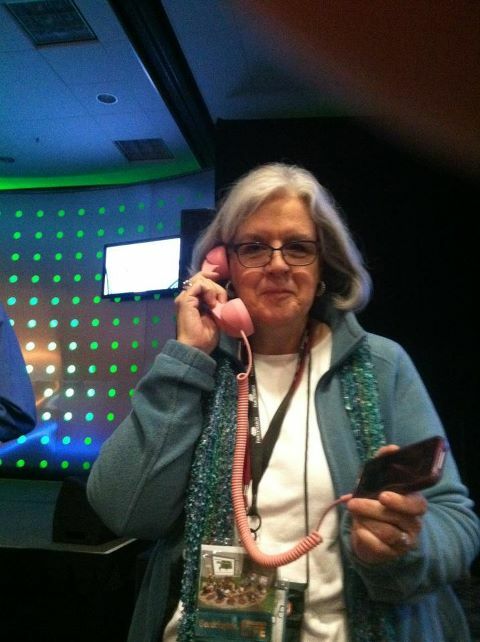 Here's the photo of Ol' Myrt taken by Randy Seaver of GeneaMusings during the opening session of RootsTech 2012. 1. Post a link to this blog post and NAME THE GADGET. 2. With the subject line "NAME THAT GADGET" notify Myrt via email: Myrt@DearMYRTLE.com, , indicating in the email where you have posted the photo and accompanying "mysterious HI-TECH gadget" description. Important Note: If you don't use that subject line, Ol' Myrt's email program won't sort your email correctly and your entry will be lost. 3. Winning entry: Mr. Myrt will choose the winning entry randomly from among the first 50 emails received, provided the emails post-date the publication of said contest entry as described in #1 above. The decision of Mr. Myrt is final, and from what I know of him, he won't accept bribes. 4. Cross Promotion: Each of the 50 finalists will be spotlighted in upcoming DearMYRTLE blog posts during February, March and April 2012. If you have a genealogy blog, this is the perfect time to draw more folks to your site. 5. Dates: The contest runs through Friday, 10 February 2012 at 12pm (noon) Mountain US time. Entries received after that time will not be accepted. 6. Grand Prize: The winner of DearMYRTLE's Name that Gadget Contest shall receive a duplicate of the "mysterious HI-TECH gadget" in the color of his choice, subject to availability from the Amazon.com website. The winner will be announced Friday night during GeneaBloggers Blog Talk Radio Show and in DearMYRTLE's blog, and will receive an email notification of same. To claim the prize, the winner must provide a valid US or Canada mailing address, unless Amazon.com happens to ship to your neck of the woods overseas.